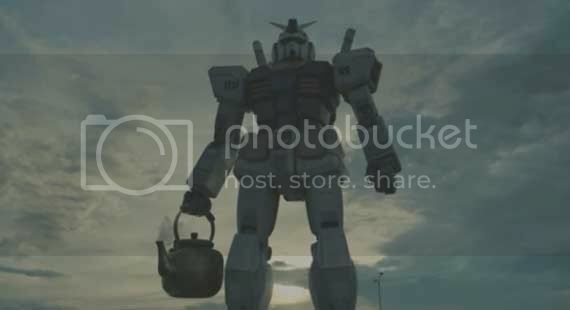 Gundam Holding A Teapot - EPIC! I guess you're thinking "why the hell does this Gundam have a tea pot?" If you've been extremely bored out of your mind you probably read a couple of weeks ago about the Collectible Gundam Cup Noodles that's being sold in Japan to celebrate Cup Noodles' 40th anniversary. I found this lying around YouTube and far as I can tell it's a TV Ad aimed to raise awareness about the collectible Gundams. It's either that or those Gundams are fueled by hot water. Just go ahead and check the break if you have a couple of seconds of your life to waste. Is this real that the Gundam is holding a teapot?